The paper shredder is among the best in the office range. It is designed to meet all the needs of an office environment. Secure Information should never fall into the wrong hands. You can have the peace of mind in knowing you are about to purchase a quality product that will provide many years of trouble free operation. Small Offices or teams of employees will benefit from the ease of use and quiet operation of these small to mid-size shredders. They're perfect for destroying personnel records, client proposals or tax information. 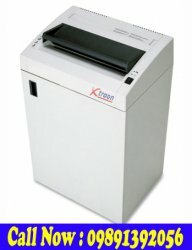 Small Office Shredders with their ability to get the job done quickly and easily with minimal effort.